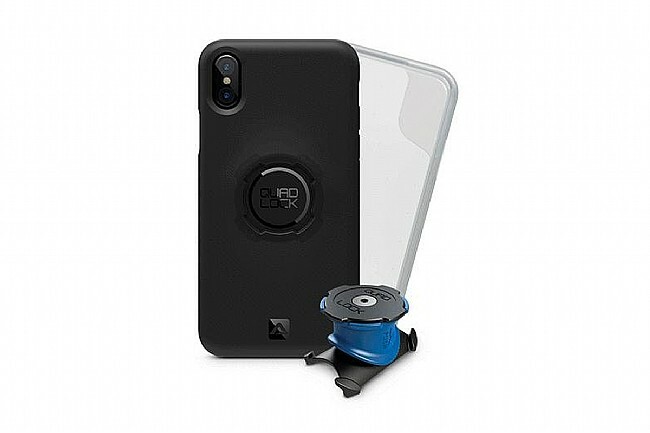 Quad Lock’s iPhone X Bike Mount Kit includes a case, mount, slip cover, and mounting accessories. The entire package is lightweight, low profile, and secure thanks to Quad Lock’s dual locking system. The mount provides reliable drop protection and the case is slim yet highly impact absorbing. The slip on cover (or Poncho) protects the phone from the rain. The whole system can be mounted to a stem or handlebars and fits tubes 25-40mm in diameter. For larger tubes, simply use longer zip ties. 1 x Quad Lock iPhone X Case. 1 x Quad Lock Poncho. 1 x Quad Lock Bike Mount PRO. 2 x EPDM mounting o-rings (small). 2 x EPDM mounting o-rings (large). 2 x nylon zip ties. Depth of Complete Mount: 23mm. Width of Complete Mount: 35mm. Length: 50mm (Stem Mount Plate). Excellent Iphone X bike mount!! I looked at various bike mounts for my new Iphone X. I'm glad I purchased this one. It comes with a slip-on cover that protects it from the rain and spills which is quite useful in Oregon. I'm pleased that the mount is securely fastened onto the handlebars and that the phone stays securely fastened onto it. The phone is easy to attach and unattach as well. It's perfect for what I need-keeping the GPS in front of me so I can see and hear it when I'm riding my bicycle around the city and on rural roads. Highly recommended.